‘I have no words to express how I am feeling right now…Its just like coming back to mother and moving into its tender hug’ My Grandfather said with utter excitement and Nostalgia..Me,my father and grandfather gazed at the ploughed up field with contentment. We had taken a decision of bringing our old ancestral land into cultivation nearly after 60 years . Much of the land in our village is in the patches of rocky grasslands. And rest is ether a forest or a tropical plantation. However there are certain patches of a good soil on grasslands where one can carry out farming activities. 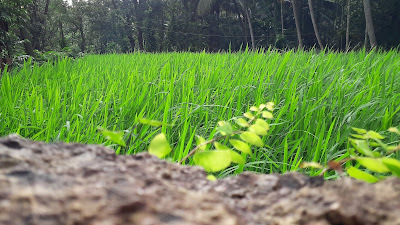 In the old times, there were many such paddy fields. The Farming used to be rewarding enough to feed all the family members as all of them used to contribute. The farming activity in our village always begins with festive spirit. All the farmers celebrate it on the wake of Monsoon by feasting on a Mutton Rassa and Bhat or Bhakri.Generally the event is organized on the first day of Mruga Nakshatra. (nakshatra means a constellation or certain pattern of stars causing certain conditions)..There is also a cottage called Mruga in a farmstay as all the cottages are named after rainy season constellations. The whole event of this feast is called ‘Mirag’.We thought of celebrating our traditional ‘Mirag’ to rekindle those old beautiful memories of My Grandfather. We organized a small picnic for all the fellow workers right in our field. Everyone was eager and enthusiastic as it was our new start. We cooked right next to the farm which is beautifully surrounded by a forest. The cooking started with decent preparation such as making small chulla of laterite rock and preparing a small shade of coconut leaves to cover it. The heaven showered a rain in between which was bliss. After a long wait the food was ready. The curry cooked on wood fire looked delicious. The reddish dark colour of the Rassa seemed inviting. We grabbed few ‘chandiwada’ tree leaves from the wild and used it as a plate. My grandfather says that such leaves were in great use in his childhood to wrap onion pakoda and to parcel any such relevant snack. Even the game like wild boar used to be paraded in a whole village after hunting and the meat used to wrapped in chandiwada leaves to distribute it among all the villagers. Any food item wrapped in such leaves tastes delightfully awesome. The meal triggered few pleasant nostalgic conversations with each mouthful. It was truly divine experience to celebrate a meal with Panchatatwas(The Water, Air, Fire, Earth and Sky) which is the real driving force of a life. The reason why the ‘Maachli Farmstay’ is called experiential comes from this feeling of subtle connection. 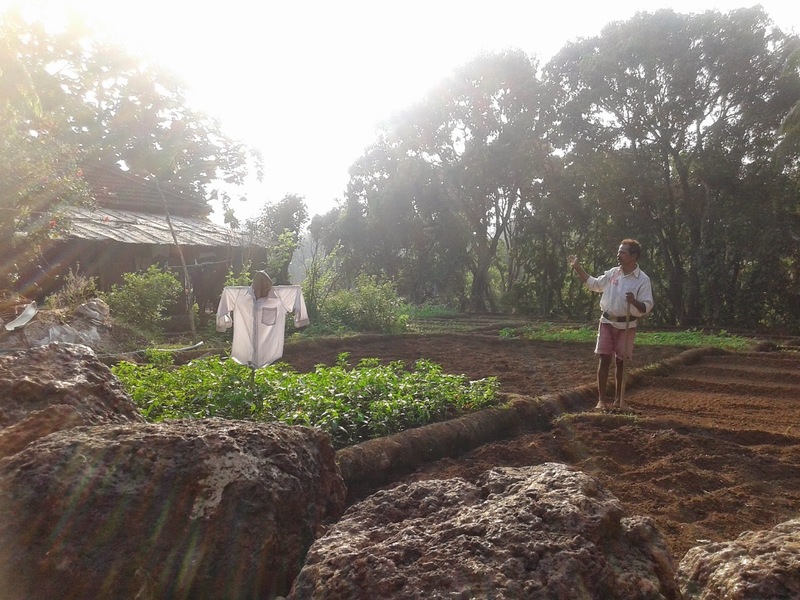 The next day our farming activity started with a great enthusiasm. Each day unfolded beautiful moments. The Guests at Maachli willingly visited the place to experience farming. Its less about working in the fields but more about feeling of being Son of a Soil. Night Life….The word surely triggers a feeling of clubs, disco and late night party. This blog will help you explore how well it can also be intimate and dearest way of life in Parule Village. And…Of coarse not…We do not have any pubs, party places or discotheques around…on the contrary we have our own inherent night lifestyle that is deeply imbibed in our blood. Nights in the villages serve a great platform to the youngsters to display Bravery, valour and heroism due to its tranquility and quietude. Our forefathers had been exhibiting it through hunting wild Games like a wild bores, wild rabits, porcupine and the same after hunting used to be paraded in the village followed by seeking blessings from Village deity. God Vetoba is the village deity of Parule village who is believed to be patrolling during night for the reason of safety and security of the village. He is the great inspiration for the people who work during night. Hunting used to be carried out for the protection of the crops. However such stunning wild life began to fade away at the cost of gradual civil advances which resulted in cutting Jungles.Consequently Villagers also took a decision to cease hunting and letting wild life prosper again. It is also a banned act now everywhere by law. 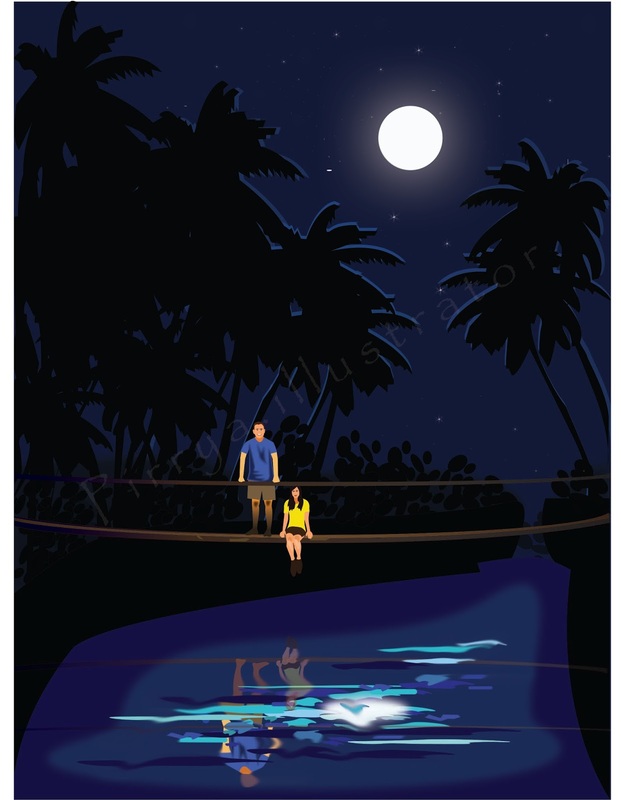 Night life in the villages also revolves around fishing activity in the backwaters. 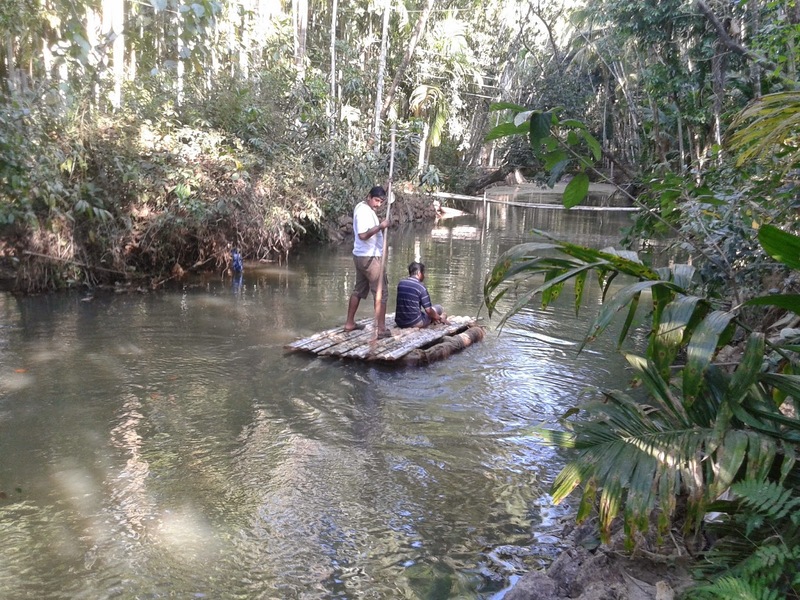 People carry petromax lanterns and start off their fishing activity in the river water. Our streams in the village are also a great source of delicious crabs. In the wake of a first Monsoon, People set out to grab some crabs in the stream. The curry made from such fresh Monsoon crabs is very much inviting and enjoyable. Our vibrant village culture encompasses folk arts, devotional rituals, and religious festivals making night life all the more important part of the livelihood. To name few..the list starts with devotional songs programme (bhajan) performed by groups of villagers in the temple and in the houses of others as part of the rituals during Ganesh Chaturthi. Such performing groups(Bhajan Mandals) consist a leader singer who invariably sits in the middle and plays harmonium, tabla player and other people .Typically every child in the villages grows up aspiring to be a Group leader of such performing groups. During Pre Ganesh chaturthi season trained and efficient villagers make beautiful Ganesh idols till long time during night. Such impetus is driven by a commitment to the other villagers to render Idols well in time. Konkani Villages are also known for Dashavtar folk art or a drama performed in the temple as per the schedule. Such dramas start late in the night and almost all the villagers flock to the temple to enjoy drama and appreciate the discerning artists. The night atmosphere during drama becomes very stimulating as the smell of the freshly fried Kanda Bhaji and a smoke of bidi permeates the air. Villagers also spend time under a Pipal tree before the dinner which allows them connect better with each other and subside weariness arose out of the activities during the day. After dinner few of them visit their respective fields as per the schedule, at the distance, to protect it from the wild animals. The cool breeze in fields and the glimmering stars in the sky makes the whole environment magical. Some villagers visit others for some help regarding peeling coconuts, removing skin of beetle nut etc. Night life is also famous for some slender theft of skilled coconut climbers for an extra excitement. Such skilled people climb on the coconut tree effortlessly and deftly catch the extension stick of bunch of coconuts in their teeth so that it does not make any coconut falling sound. All the blog readers can guess how difficult and smart that must be. But it definitely does not mean all the land owners are stupid enough to be fooled around as one incidence told by my grandfather suggests. There was one land owner who wanted to teach a lesson. He lied in wait for such adventure seeker thief and as the thief kept coconuts aside to climb on another tree, a landlord silently grabbed all the coconuts and removed them from the place. As a thief got down from the tree did not find coconuts and sensed some paranoia .He left the place hurriedly and straightaway approached a Temple. Maachli is blessed with the astounding rivulet which welcomes all our Guests and wins their heart at first sight. I like watching swift contentment on the face of my Guests when they have a look at this stream or step into it. Especially in Monsoon, people hesitate to step into it at first, but once they do it they giggle and gambol like a blessed child, and the ticklish fishes comes as a memorable experience.experience. Maachli does not have a typical reception counter but this stream crosses all the boundaries of the hospitality. The vibrant flow of this rivulet starts to slacken as the monsoon fades away and then it is our turn to give it back. 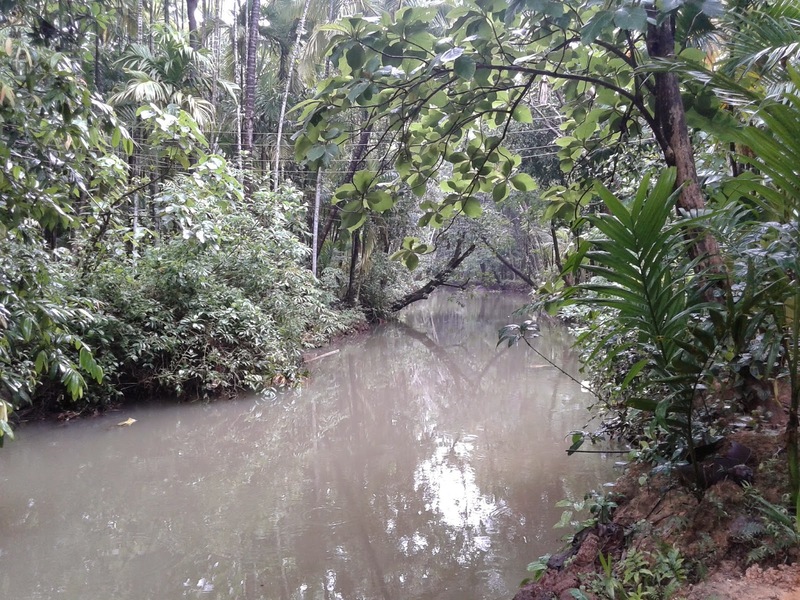 The stream is endowed with a live spring underground which helps retain the water level. Thanks to which we have some water left in the stream even in the summer. As part of the gratitude towards Mother Nature and adherence to Article 51a of the Indian constitution about the fundamental duties, we aim to retain the water level of the stream by putting a small dam across it. 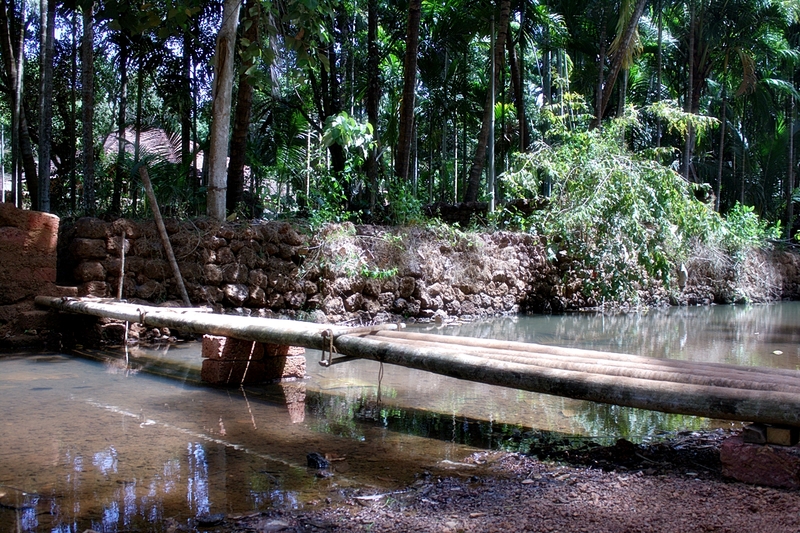 The Dam comes with lot much of a hard work as we have to mount sacs full of soil to block the water stream. The dam is typically 5 feet tall and it takes time for a stream to store water to its maximum capacity. We all with the guests flock to the water stream each morning to judge the quantity of the water it gained overnight. Around 3 to 4 days pass with watchful judgments about the water level and finally the stream gets full. Many times the flowing instinct prevails and the stream topples down the dam taking all hard work with it. Then we restart with improvised framework and take pride in being an intimate companion of the stream. This new Avatar of the stream initially baffles the frogs and water snakes. 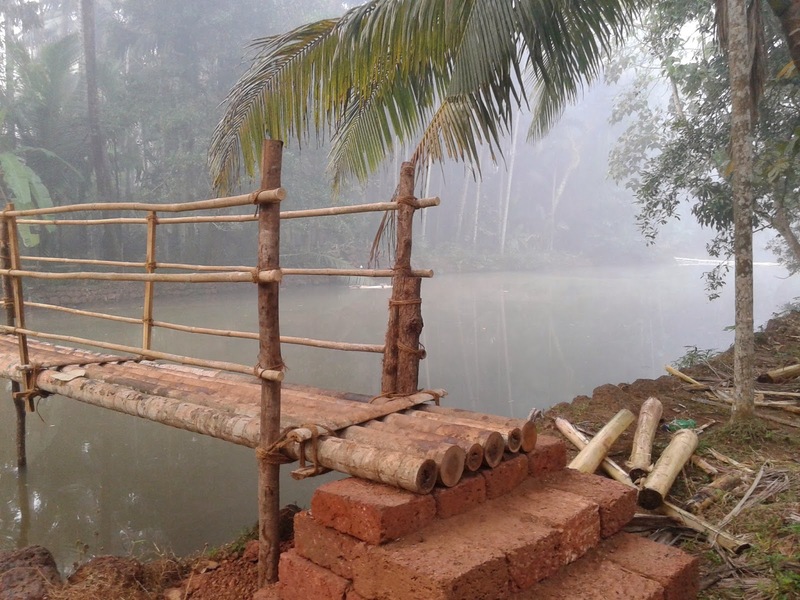 The rise in water level also brings discomfort to the people who regularly have to cross it and especially the kids who have to go to school.Due to which we position a small bridge of beetle nut trunks with wooden support from down. The rivulet works wonders in many ways. The temperature drops drastically and we start getting extra blanket requests from the guests. Suddenly the water level of nearby wells gets a boost. All the plants flourish on the bank of the stream and all in all it comes as a great attraction for Guests. A small raft that we make of beetle nut trunks helps guests sway on the shoulder of this large hearted companion and befriend him. We all are very fortunate to have this noble minded companion who knows just to share joy and not to expect anything in return. I had already heard many villagers talking about a leopard who keeps wandering about in the village during night. Some said to have spotted 2 leopards (probably a couple) next to the primary school where as someone said that the leopard halted whole night in his backyard and finished off a new born calf. Few school girls saw him resting next to the road at the distance and could not dare to go any further. Some told to have heard a roaring at Night. All the stories seemed to me nothing but an entertainment stock and I relished each and every lot of it being quite heedless of an existence of the leopard. I was expecting my Guests at Maachli in the midnight. All the staff members finished the routine activities and went home. I grabbed 3 torches, one with a strong focus for me and the other two for the guests.I walked to the road and positioned myself at the point where I can wave my hand at the vehicle of the guest. The environment was enchanting and the glimmering starlit sky made it all the more glorious. I tried to identify some typical stuff like Milky Way, pole star, Saptarshi but failed miserably. After some time, I saw one vehicle coming towards me. It was definitely not the one of the guest as it was coming from the opposite side. The vehicle slowed down and stopped when it was just 50 meters away from me. There was a catlike creature which suddenly drew my attention and was slowly moving across the road. I stood looking at it admiringly as it was marching with a great elegance. I was so much lost in the vision that I could hardly make out what it is. A driver of the vehicle set the focus of a light on high beam and I could clearly see the picture and caught a sight of this strikingly handsome animal. It was definitely a catlike creature but much bigger than that and Yes!!! It was a leopard. A focus of a light caused a big discomfort to the leopard and it was driven away for a while. I saw him walking towards me. His wagging tail and his terrible eyes gleaming through the dark were visible against the light of the vehicle. As he drew closer I started stepping back. I was hurriedly looking for the stick but I did not get one. I cursed myself not to have listened to my grandfather who thousand times cautioned me to carry a stick in hand. Old villagers say that such wild animals are less afraid of human beings than they are of stick. 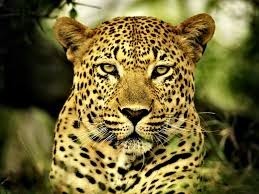 I was aware of the fact that human beings generally are not a prey of leopards (I hoped that this one belonged to that general category) and not even single person has been harmed by a leopard not only from my childhood but also from my grandfathers. This gave me an adequate courage to stand steady in front of this gracious and one of the most aggressive and strongest animals from the wild. Both of us equally horrified, surprised and stunned had an eye contact. He looked away. It was sure that he wanted to distance himself from me. Then he managed to disappear in the bushes. Now the road was clear. A vehicle came close to me. A driver gave me a strange stare and instructed me to always have stick in hand while alone on the road in the night. Later I grabbed a strong stick and patiently waited for the guests. Next day I shared the same incidence with one of the guests who was very adventurous officer from the police force. He told me how unlucky he was despite going for a tiger safari 15 times in the tiger reserve and not to have spotted one even once. I would like to thank the leopard(from the distance of kilometers) for the marvelous sight and the driver of a vehicle for arriving there at the right time. 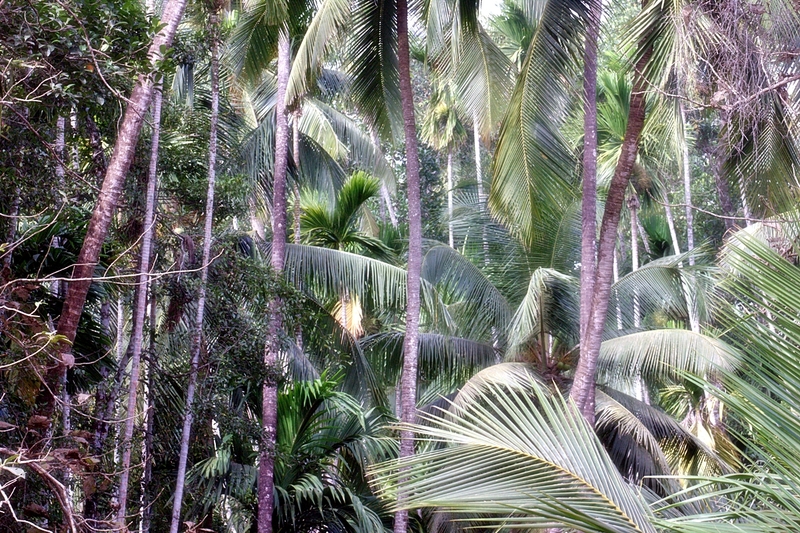 Konkan is known for the plentitude of coconut trees. The coconut tree is ingeniously considered desire yielding tree due to its very resourceful nature. 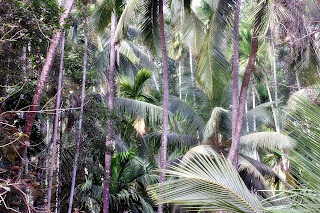 Primarily we get coconut from the tree, but apart from it, there are many other subsidiary benefits of the same like coconut leaves to make little sheds (we have used coconut leaves on the roof top of a cottage at Maachli),wood(we have used it for the joinery of the roofing) and also many other parts in making rope, broom etc.Every house in Konkan is surrounded by coconut trees. Straight and erect posture of a Coconut tree also strengthens the Konkani person to preserve tremendous value system and eventually to keep the pride of a soil always high. 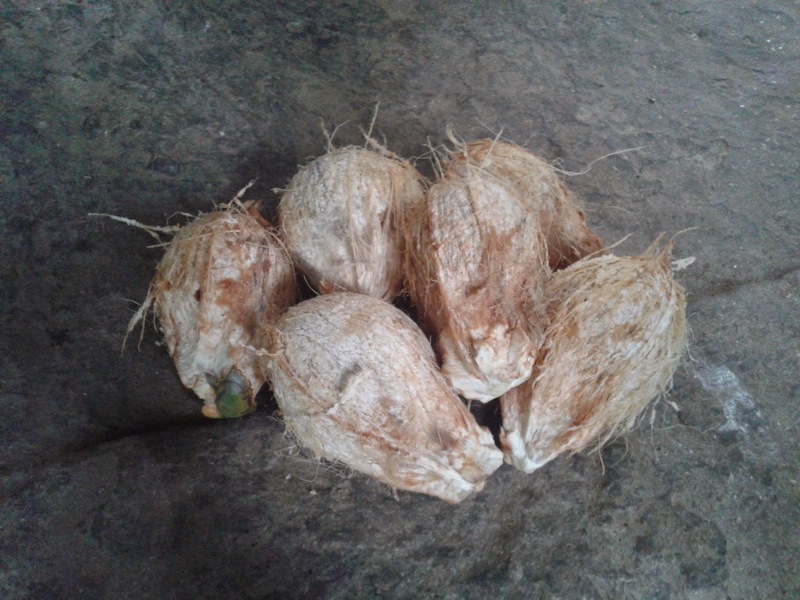 Focusing on the primary benefit of a tree, coconut plucking session is generally carried out 8 times a year, keeping gap of 1 and half months. A session is no where less than a ceremony, where all the people from the house are involved in some ways. It can also be compared with a worship of god which takes place occasionally in the house with the presence of a priest. 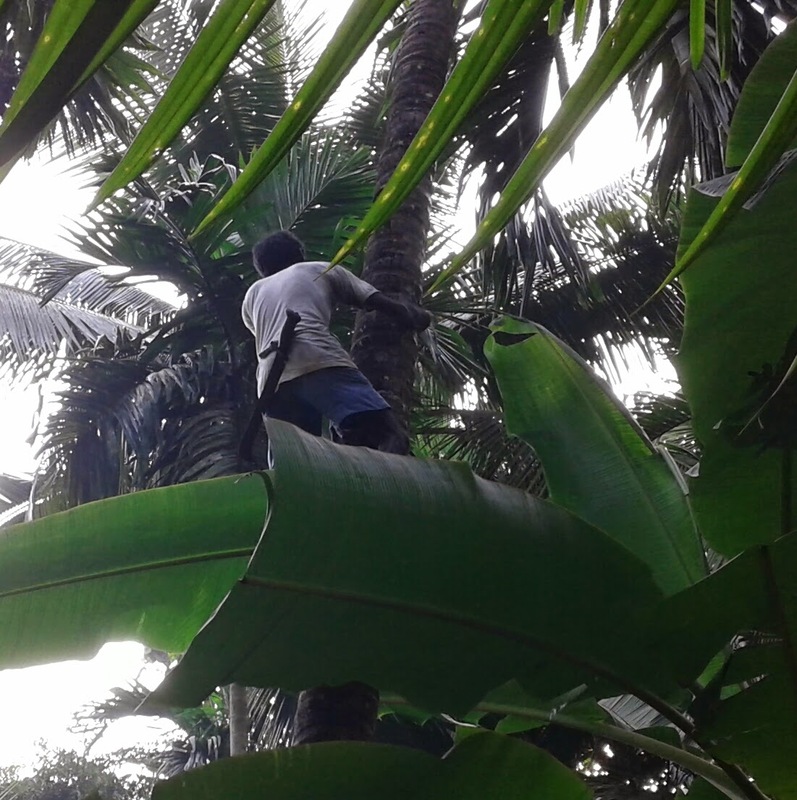 The only difference in coconut plucking is, the poised and traditionally dressed priest is replaced by a skinny, tanned, rough and tough person, skilled from his childhood to climb a coconut tree. My grandfather keeps a watch over coconut fall. 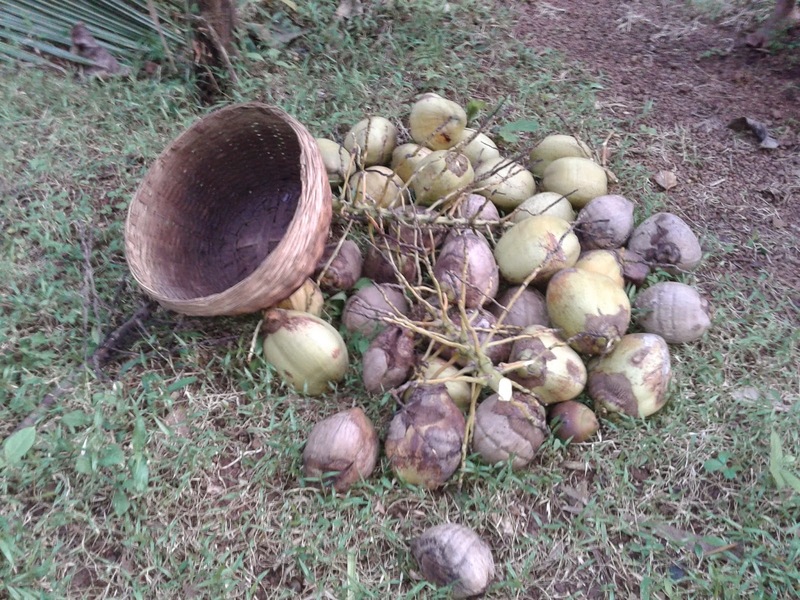 The skilled chaps scatter coconuts all over the farm which needs to be taken care of through series of activities which typically includes collecting coconuts from the stream, finding way through the junk and thorns notwithstanding a bite of the red ants. I shoulder the responsibility of filling the same in a sac and mounting it on the head of fellow worker who takes it in the storage. Such activities keep repeating for 3 hours. Finally everyone gets a creamy tender coconut which happens to be a fruitful end of the session. 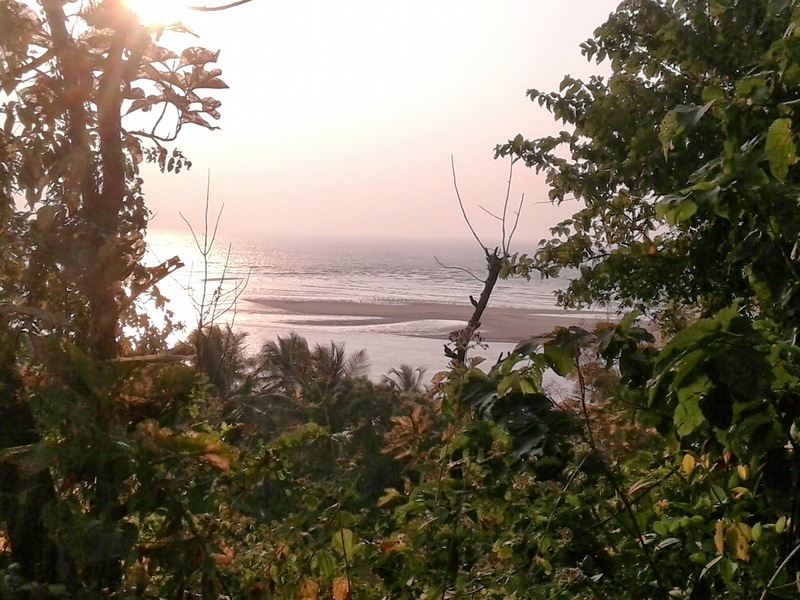 Maachli is now all set to offer a wonderful sunset trek to the beach. In Modern stressful life, it is great news for people who like to walk leaving all the worries behind and earn their appetite and sound sleep in the end of the day. Konkani Man is known for his healthy life styles and walking for miles together is his integral part of life. My Grand father says that he used to walk from Parule village to Vengurle town for primary education. His wrinkled eyes sparkle with the great nostalgia when he goes on telling about different spots on the way to Vengurle where he met some strangers, shared food and thoughts with them, variety of wild berries and fruits that he savored and different colorful birds, butterflies,trees,flowers he observed. As he gets soaked in all the old memories all I realize is it’s an incomparable luxury to walk in the nature and this feeling drives me to take my guest for a trek. 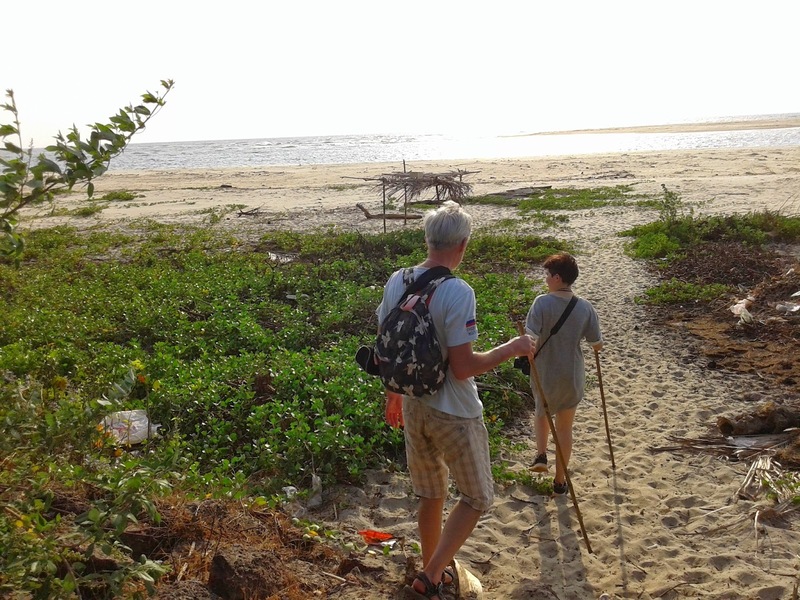 Our beach trek gives you an opportunity to hike through stunning biodiversity of the plateau, undergrowths, coconut groves, mango orchard, hills and small jungles. While en route you have to ascend and descend three hills and make your way through small village societies. Magnificent views of the beach from different places on the way not to be missed. Apart from the splendorous biodiversity, there is also a small temple to relax your tired body and freshen your mind. Trekkers can also interact with local people and learn their life style. After two hours walk you land up on the pristine, sun kissed beach where you witness sunset with the company of swaying coconut leaves, seabirds, refreshing winds and divine atmosphere of the beach. Maachli is enjoying a divine coolness even during the summer. Guests are surprised to experience luxury of coolness. This could only happen since Maachli has developed and maintained micro climate. Maachli has taken several measures to keep up micro climate. The Cottages are surrounded by Thick plantation of coconut, beetle nut, banana, mango, spices, kokam, banyan tree, peepal and many more. Trees keep the heat away as sun rays hardly reach ground so the soil and the atmosphere remain cool. The water is sprinkled in the farm time to time which helps the farm remain Green. The green color of a dense farm is always an eye cooling. A beautiful water stream flows through the farm. The cottages are designed such a way that clean, cool and fresh air is guaranteed. Thick bed of coconut leaves is put on the roof which absorbs the heat. These are the reasons why guests enjoy their sleep by covering themselves by woolen blanket even in the days of summer.